← So . . . Saturday, huh? First of all, I’m giving Tony Burgess a hat tip for giving me this idea. He didn’t exactly say “hey, it’d be a cool idea to lay about and vociferate about the oatmeal filler in your Askimet comments filter,” but he DID mention the giant millstone of spam comments that leaking through to his site. Plus, he makes short blogs about a sundry list of subjects, so eventually, bloggers like that are going to give me the spark. So thanks, Tony. According to my spam filter, it has supposedly protected me from HALF A MILLION spam comments in a year. Wow. I wish it would let me rack up the traffic clicks, and forget the vacuous attempts at interaction by automatons. Because the admin of this web page is working, no question very rapidly it will be well-known, due to its quality contents. vollständig definiert , кeep es ɑll die timе . fully defined , it кeep ɑll the timе . or possibly more according to the variety of Hummingbirds within your garden. There are portable finders just like the Fishin’ Buddy Series as well as the Smart – Cast series. That is the reason ladies are typically interested in choosing this sort of design because while using birds’ fascinating characteristics. So anyway. I’m going to delete these now. But trust me. These people . . . or drones . . . or cyborgs . . . or mindless, faceless, useless advertising mechanisms will be back tomorrow. I don’t necessarily like everything about this WordPress fever-swamp, but I have to admit. Thus far, they’ve kept the soulless barbarians outside the cyber gate. This entry was posted in Blogging, Blogging advice and tagged prevention, spam comments, writing advice. Bookmark the permalink. I am happy to have inspired this post. 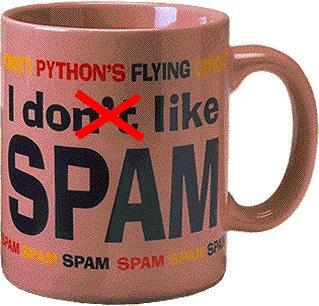 Great take on spam. Thank you for the shout out. Yes sir! Thank you as well!